The classic dinner cruise begins at 6pm. The upgraded dinner cruise (Etoile, Privilege, Premier and Decouverte) begins at 8:30pm. The Seine River dinner cruise is available on a daily basis all year round. When night falls, the experience is even better. We are comparing Paris: Beteaux Parisiens Dinner Cruise Prices from leading ticket suppliers and Try to find you Cheap tickets prices on the market. The Bateaux Parisians Dinner Cruise is a convenient package that combines two extraordinary experiences of the French capital city. It is a pleasurable cruise along the beautiful riverbanks of the River Seine, dotted with magnificent points of interest. Also, the cruise offers a delicious dinner, consisting of the very best of French cuisine. If you select the upgraded dinner, you will enjoy the live music performance during the romantic evening cruise. As you cruise along the River Seine, the true meaning of Paris's nickname "the City of Light" reveals itself. The boat passes by spectacular attractions, illuminated with soft lights. Along the way, you will have a pleasure to examine the sparkling Eiffel Tower, the floodlit Les Invalides, the Notre Dame Cathedral, the Alexandre III Bridge, Trocadero and other nearby attractions. A gourmet dinner on board the boat is especially romantic couples. Your Experience With Paris: Beteaux Parisiens Dinner Cruise? Become enchanted as you cruise along the floodlit riverbanks of the Seine River. As you cruise along the UNESCO-declared banks of Paris's main river, you will see many iconic monuments and points of interest at their best. Once completing a tour by river cruise you will know the true meaning of Paris's nickname "the City of Light." Pass by monuments and landmarks which date back to Gothic, Belle Epoque, Renaissance and other eras. Get up close to the Notre Dame Cathedral, the Pont Neuf, the Pont Alexandre III, the Eiffel Tower, the Les Invalides, and other iconic attractions. Enjoy a delicious dinner while the points of interest of Paris pass before your eyes. If you choose the upgraded dinner, the live music will entertain you along then cruise. 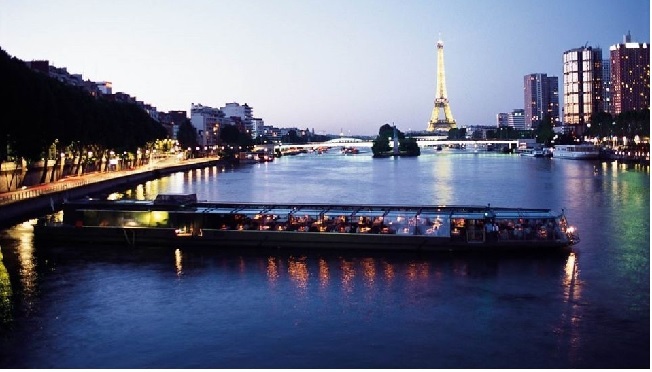 What Paris: Beteaux Parisiens Dinner Cruise Includes? A 1.15 or 2.30-hour cruise, depending on the option you select. A dinner consisting of 3 courses. A choice of dinner menus. Live music on board the boat (upgaded ticket). Starter, main course, dessert and beverages. The Seine River cruise at night with dinner is one of the most romantic experiences in Paris. Travelers Reviews about Paris: Beteaux Parisiens Dinner Cruise? This activity has a high rateing from travellers that booked the cruise via Get Your Guide (4.7 out of 5) and Viator (5 out of 5). Overall participants were satisfied with the staff's performance and the dinner. Many of them describe the experience as "very romantic." People with limited mobility are welcome to join the cruise, however, the boats don't have wheelchair access to the lavatory. For this activity, you can present either printed and electronic voucher. Certain providers allow the full or partial refund for cancellations a few days before the scheduled dinner cruise. You should wear smart casual attire during the Seine River dinner cruise. Restrooms are available on board the boats. Times for the check-in are from 5:15pm to 5:45pm for the classic dinner cruise and from 7:45pm to 8:15pm for other dinner cruises. Guests under the age of 18 won't be served with alcoholic drinks. Vegetarian options are available if requested in advance. The point of departure of the dinner cruise is at the Port de la Bourdonnais, pier 5 or 7 address.